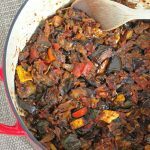 Make this ratatouille ahead of time for part of a dinner meal and use the leftovers for an unforgettable breakfast with a runny egg on top! 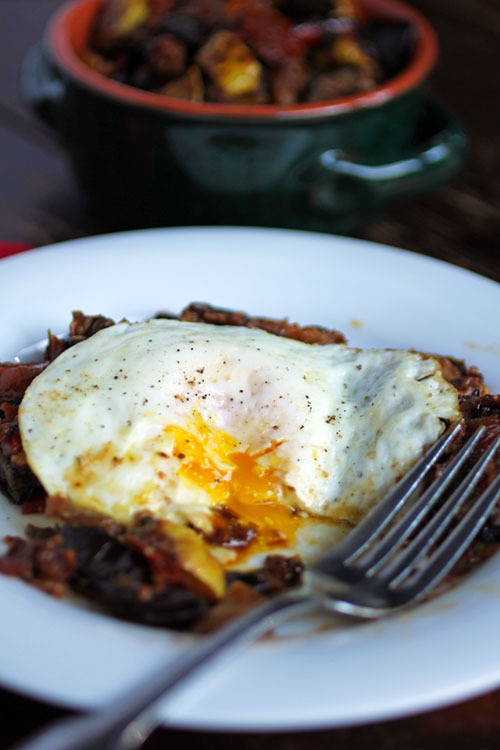 So I was excited by this month’s Recipe Redux theme of “Rise and Shine with a Savory Breakfast.” But how could I make my morning eggs, extra special? 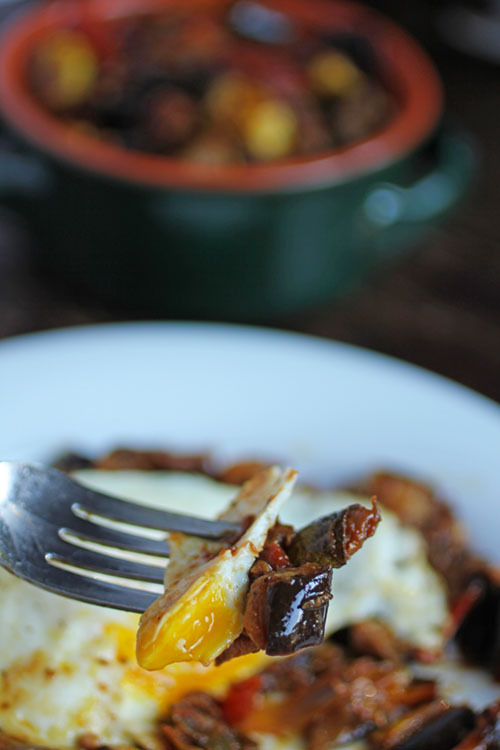 And then it hit me, something I had done on a whim a year or two ago with leftover ratatouille – enjoyed a big plate full of it with a fried over medium egg on top. And then I couldn’t get it out of my head and I had to make it RIGHT AWAY! Let me back up and tell you about how I first came to love ratatouille – and yes, long before the adorable Disney movie came out. On a family ski vacation many years ago, my brother-in-law broke his foot and so spent his time in our condo cooking up delicious meals for us (did I mention he is also a chef?). 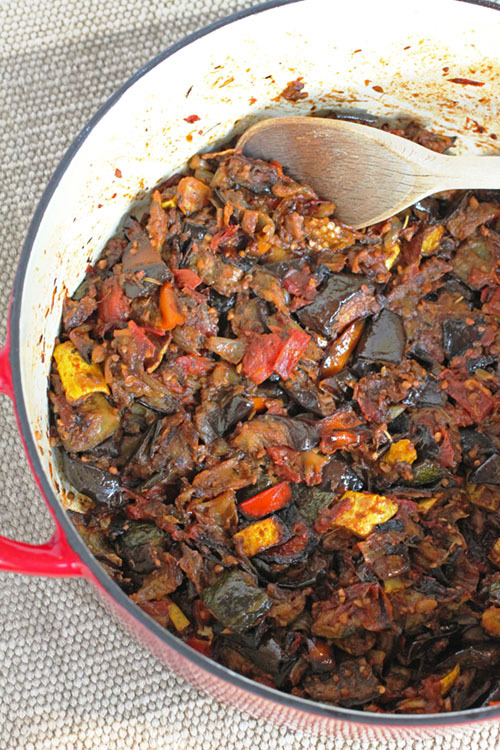 One evening he made ratatouille and it was the most amazing thing I had ever tasted. I had only recently come to like eggplant and had never had the dish before. Fast forward a few years, and I did my best to recreate the caramelized, yummy melt-in-your-mouth flavors using summer produce and herbs. I was fairly successful the first time though I was probably the only one in my immediate family who ate it as my husband isn’t fond of eggplant, and the vegetable mixture probably horrified my young children. But I decided to give it another go for this challenge and used a different technique for getting that sweet, caramelized flavor for the vegetables – roasting! Now, this isn’t something you are going to make one morning for breakfast necessarily. Ratatouille does take some time, especially since I roasted the vegetables first. But it is easy to do if you plan ahead and do it in stages, or better yet, roast up a bunch of vegetables for dinner one night and then use the leftovers to make the ratatouille later. I just love cook once, use twice meals! And this is certainly that. 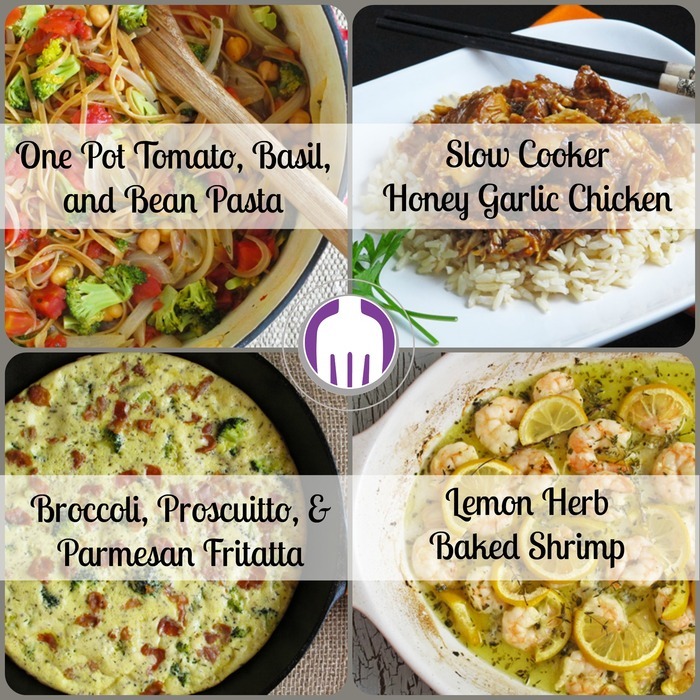 You can vary the vegetables to what you prefer or have on hand. Fresh herbs will definitely help kick up the flavor a notch, but dried work just fine too. In fact, I used dried when I made mine because I forgot to raid Lesley’s garden first for her fresh herbs and I didn’t want to make one more trip to the grocery store for just that. 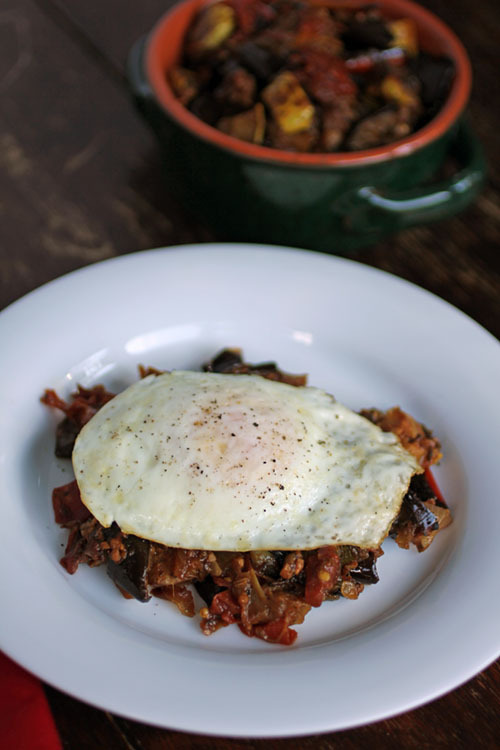 You can enjoy the ratatouille as a dinner side dish and then use the leftovers for breakfast – all you have to do is fry up an egg and serve on top of a plate of ratatouille. And ratatouille tastes even better the next day. Personally I prefer to heat up the ratatouille first, though it can be eaten cold or at room temp. This classic French dish is a make ahead dream. Roast the veggies in advance, or better yet, roast up a double batch to use some for dinner and then use the leftovers to make the ratatouille the next day. Preheat oven to 400 degrees F. Spray 4 sheet pans with cooking spray, or work in batches as needed for vegetables. In a large bowl, toss the eggplant with 2 tablespoons of olive oil, 1/2 teaspoon of rosemary, 1/2 teaspoon of thyme and 1/2 teaspoon of basil. Spread the eggplant in a single layer on a sheet pan and roast for 30 - 40 minutes, or until browned, stirring halfway through. In the same large bowl, toss the zucchini and squash with 1 teaspoon of olive oil, 1/2 teaspoon of rosemary, 1/2 teaspoon of thyme and 1/2 teaspoon of basil. Spread the zucchini and squash in a single layer a sheet pan and roast for 30 - 40 minutes, or until browned, stirring halfway through. In the same large bowl, toss the onion with 1 teaspoon of olive oil. Spread in a single layer on a sheet pan and roast for about 20 minutes, or until browned, stirring halfway through. In the same large bowl, toss the bell pepper with 1 teaspoon of olive oil. Spread in a single layer on a sheet pan and roast for about 20 minutes, or until browned, stirring halfway through. After vegetables have roasted, heat remaining 1 tablespoon of olive oil in a large pot. Add the garlic and saute for 30 seconds to 1 minute until fragrant. Add the tomatoes and their juices to pot with a 1/2 teaspoon of dried basil and cook for about 10 minutes. Add the roasted vegetables to the pot and stir together. Cover and simmer for 30 minutes, stirring occasionally. Add more olive oil as needed to keep vegetables moist. Season with salt and pepper and serve. 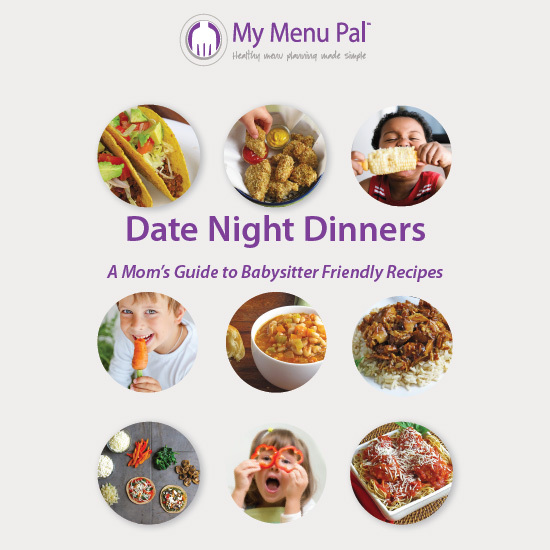 The eggplant, zucchini, squash, onion and bell pepper should be cooked separately on sheet pans (except for the zucchini and squash - they can be mixed together) to allow for even roasting. Do not crowd vegetables on pan, otherwise they will steam and not roast. Work in batches if needed. To use fresh herbs instead of dried, use 3 times the amount as called for in the recipe. Roast the vegetables a day or two ahead of time. Then proceed with recipe beginning at step 6. Now if you are wondering how my family reacted to the ratatouille this time around – I honestly don’t know. I didn’t offer it to them and I’m keeping it all for myself to enjoy throughout the week! Ha! 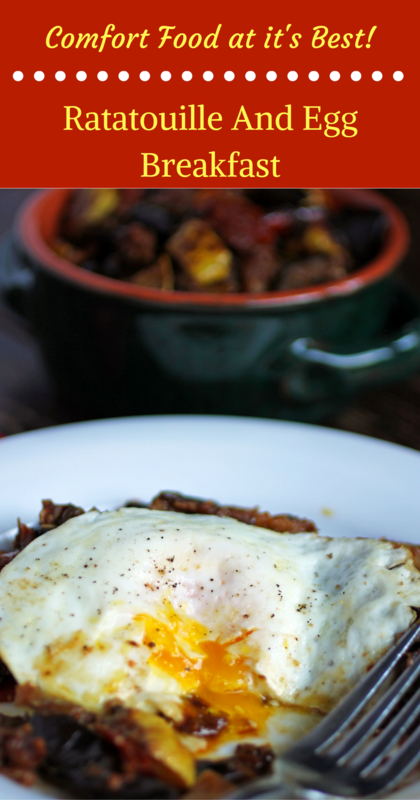 Be Sure To Check Out the Other Recipe Redux Savory Breakfast Creations!